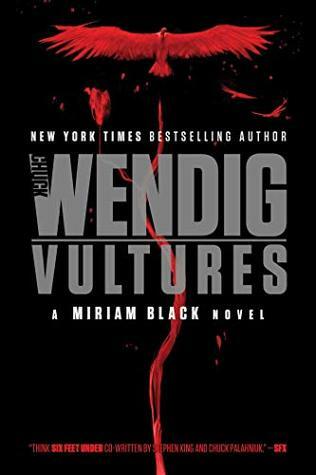 With Vultures, Wendig takes the entirety of his six book saga and culminates it with a high-stakes chase against fate. We pick up with Miriam after the catastrophic events of The Raptor and The Wren. Newly pregnant and on the run, Miriam is getting ready for a final showdown with her tormentor, The Trespasser. However, it still has a few tricks up its sleeves, what with being able to possess people and making them do very bad things. Miriam needs a way to circumvent her destiny and she needs safe passage to deliver her baby. Luckily, an FBI agent approaches her with an offer – track down a serial killer who is murdering young, fresh-faced actors in Los Angeles in exchange for a clear record, lodging and health care to boot. The end is here. Things are about to get messy. I love Miriam. She is brutal and nihilistic, yet scrappy and heroic. She’s extremely well written, even if she is vulgar and completely, infuriatingly self-destructive. Even when she gains a modicum of ground, it won’t be long until she finds a way to take two giant leaps backwards. If anything, she’s consistent in her own sabotage. She is one of the best representations of mental illness I’ve come across in my years of reading. She doesn’t feel she deserves anything even remotely good because her comfort lies in her own misery. Granted, with a curse like hers, it’s hard to accept happiness and it’s probably safer to avoid fostering relationships with others. Yet, even though she is constantly her own worst enemy, you can’t help but feel for her. In the few instances she allows herself to show some vulnerability, she’s usually kicked to the side of the road and left for dead. So, you allow yourself to invest in her – you care about the outcome. Every decision matters and when death lurks around every corner, the choices Miriam makes have substantial, long-term consequences that send ripples throughout all six novels. There are some seriously excellent moments in this novel. The way Chuck showcases The Trespasser and its newfound abilities leads to some pretty chilling scenes. This is all killer and no filler when it comes to the more horror-inspired instances. To steal a line from Jean Sheppard, “Chuck works in profanity the way other artists might work in oils or clay.” As always, the dialogue between Miriam and others sizzles across the page like bacon on a blisteringly hot pan. It’s just as tasty and satisfying to consume as well. For those who are worried that after all this time Chuck may botch the ending? You can put to rest those fears. Chuck had me gripped right up until the end – although he made sure to keep the threat of a dagger over my heart as I was speed-reading to find out everyone’s fate. I’ll spare everyone the ending (of course), but I think you’ll be satisfied with what Chuck puts out there. The Miriam Black series is one of my absolute favorites and I’m happy to say I had a blast from the beginning of Blackbirds to the last page of Vultures. Is it perfect? Probably not to everyone. But it’s about as good and concise an example of enjoyable consistent storytelling as you can find.